We do not have a barn. And we have a milk cow. She is sweet natured and loves visitors and getting rubs and pats. Don't touch the dog, but the cow is fine. Her calf, and the additional calf she has been nursing, are big now. That means it is time for the farmer to have milk again! The calves have been consuming all she produces for months now. When we attempt to get milk from her there is not a drop left. 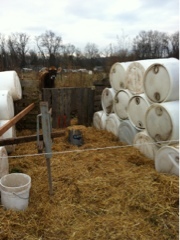 Homer reused the rain barrels, stacking them into a configuration like walls, to cut down on the wind. He removed Sybil from the herd, put her into a separate small paddock area, then escorted her into the alfresco milking parlor.